Katie Goldman, 7, was pressured at school for liking "Star Wars"
(CNN) -- Katie Goldman's universe extends from her home to her first-grade classroom. She is a big sister to Annie Rose and Cleo, a piano player, a Spanish student, a wearer of glasses. She loathes the patch she has to wear for one lazy eye. She loves magic and princesses and "Star Wars," an obsession she picked up from her dad. The 7-year-old carried a "Star Wars" water bottle to school in Evanston, Illinois, every day, at least until a few weeks ago, when Katie suddenly asked to take an old pink one instead. The request surprised Katie's mom, Carrie Goldman. It didn't make any sense. Why would her little sci-fi fan make such a quick turn? Goldman kept pressing for an answer. She wasn't expecting Katie's tears. Kids at school insisted that "Star Wars" was only for boys, Katie wailed. Her daughter said she was different enough already -- the only one who was adopted, who's Jewish, who wears glasses, who needs a patch. If sacrificing Yoda for the color pink would make her fit in again, so be it. These weren't nameless, faceless bullies who taunted her daughter. They were good kids Katie ran around with on the playground. They were getting older, though, and starting to see what made people the same -- and different. Now, it was about "Star Wars," but Goldman wondered what lunchroom teasing would progress to in middle school, high school or college. "Is this how it starts?" Goldman wrote in her blog, Portrait of an Adoption. "Do kids find someone who does something differently and start to beat it out of her, first with words and sneers? Must my daughter conform to be accepted?" A few days later, in Orlando, Jen Yates clicked on a link that led to Goldman's blog. Yates couldn't shake Katie's image when it flashed across the screen -- a little girl with long blonde hair, no front teeth, square-rimmed glasses. "When you hear about bullying, it's like an abstract concept," Yates said. "When you put a face on it, an adorable little girl's face, with glasses, it brings it home." We've all had those kinds of experiences, if you call yourself a geek. It was about Katie, but it was about every girl out there, every geek out there. Yates remembered the isolation of being the weird kid at her high school. She was the teen who hit "Star Trek" conventions on weekends and got snide comments about it the rest of the week. She was the lone geek girl among her friends, mostly geeky boys. Bullying tragedies dominated headlines this year after a spate of suicides. Studies revealed how deeply the bullies at school, home or online can traumatize kids. The federal government laid out new anti-bullying guidelines for educators trying to combat the issue. It's tough to lay out anti-bullying rules for kids so young, but tougher still to know how to protect the bully's perennial target: geeks, nerds and anybody whose interests stray from the norm. Whole genres of pop culture are devoted to ridiculing them and Yates knew that Katie's story was how it starts. Katie isn't alone. Girl geeks are a growing force. "We've all had those kinds of experiences, if you call yourself a geek," Yates said. "It was about Katie, but it was about every girl out there, every geek out there. It transcended gender, it transcended age. "I know a Katie. I was Katie." So Yates did what any geek would -- she went back to her computer. "My fellow geeks," she wrote on her blog, Epbot.com, "I need your help." Later that day, in yet another time zone, Catherine Taber clicked Yates' post about a little girl and her "Star Wars" water bottle -- Katie. Taber grew up on science fiction and fantasy, from Stephen King to "Star Wars," but she wasn't bullied. She was an Army brat, always the new kid at school. With each new place, her parents reminded her to be whatever she wanted, and be proud to share it with the world. Catherine Taber, who voices Padme Amidala, saw Katie's story, and shared it with her castmates. "I immediately had to say something," Taber said. "The whole theme of the 'Star Wars' universe is an anti-bullying theme. It's good versus evil, standing side by side with your friends, doing what's right. One of the most important things to stopping bullies in their tracks is to empower kids to stand up for themselves." Taber found Katie's mom's blog, sent it to everyone she knew, and left a comment she hoped would help. "I am [the] actress who has the great honor of being Padme Amidala on 'Star Wars: the Clone Wars!' I just wanted to tell Katie that she is in VERY good company being a female Star Wars fans," Taber wrote. "I know that Padme would tell you to be proud of who YOU are and know that you are not ALONE! "THE FORCE is with you Katie!" Back in Evanston, Carrie Goldman was feeling good. Since she had written about the water bottle incident, other parents at Katie's school had talked to their kids. School leaders were supportive, and working on an anti-bullying program. Something else was happening, too: Traffic on Goldman's blog was exploding. Some 1,200 people had left messages there for Katie. Readers were coming from Yates' blog, where more than 3,000 more comments stacked up. There were links from "Star Wars" message boards, parenting blogs, tech sites. A Twitter hashtag, #maytheforcebewithkatie, streaked across social media. Guys and gals of all ages wrote about how they'd been bullied, and how life had gotten so much better since then. They shared that they loved "Star Wars," that they wore glasses, that they were adopted -- just like Luke, just like Leia, just like Katie. ThinkGeek, a nerdy online retailer, sent Katie a lightsaber. Artist Scott Zirkel sent a cartoon of Katie as a Jedi, glasses and all. A first-grade class in California sent letters to Katie as a show of support. Taber and the rest of the cast of "Star Wars: The Clone Wars," sent "Star Wars" merch. Ashley Eckstein, who voices the female Jedi Ahsoka Tano, sent Her Universe clothes tailored for girls. Tom Kane, who voices Yoda, escorted the Goldmans to a screening near their home. 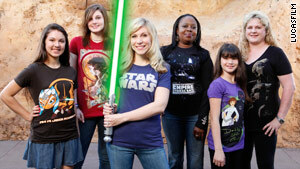 Ashley Eckstein, center, the voice of Ahsoka on "Star Wars: The Clone Wars," sent Katie some girl-friendly gear. The thousands of comments left online will be bound into a book for Katie to read whenever she needs it. To keep a sense of normality at home, the family reads just a few every night. Katie, and her parents, have learned that the universe is so much bigger than the first grade. "You realize how, if you want someone who has something in common, all you have to do is reach out," Goldman said. "It feels really, really good. What we want is for it to feel good for other people." Katie is donating many of the books and toys to other kids. A fan created a Facebook event suggesting that people wear "Star Wars" gear on December 10 to support Katie. The Goldmans also asked participants to donate Star Wars toys to charities for the holidays. About 20,000 people have signed up. "What strikes me is how these individuals who were once so isolated are now part of a very tight community," Goldman wrote on her blog this month. "They have found each other; they are plugged into each other, and they have each other's backs. Now they have Katie's back, too." Katie isn't doing any more interviews. There are scales to practice, Spanish words to memorize, baby sisters to play with. She still has to wear the dreaded eye patch, and eat lunch with the kids in her class. She is very busy being 7. But on December 10, her school will host Proud To Be Me Day. Kids will be encouraged to wear something that shows what they're interested in, whether it's princesses, sports, animals and anime. Katie will have the force of thousands behind her, and a "Star Wars" water bottle.